Salutations! Fall has definitely found its way to the East Coast and it’s feelin’ fine. The air is crisp and cool, the sun is shining, and the bright colors of autumn are covering the trees. It’s like a warm blanket of sunshine on the nearby trail. Ahh… can you tell I really like fall? As much as I hate to be working indoors when all these lovely things are happening outside, I have been slowly chipping away at the family room. Although it’s not finished, here is what I’ve got going so far. The Dover White paint is on and the French toile drapes are back up, and looking a little better with the new wall color I think. 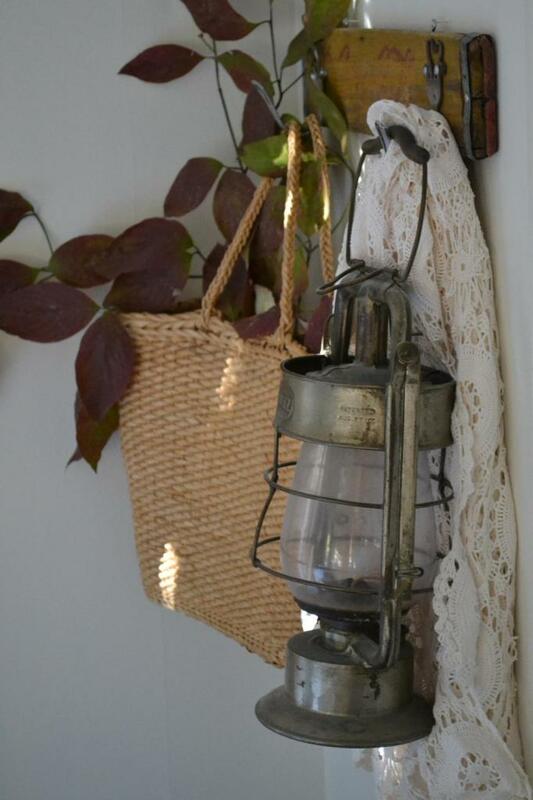 I added lots of earthy brown baskets and woods and this cool vintage lantern that belonged to my grandpa Buck. Man he loved that lantern, it hung in my grandparents kitchen ever since I was a kid. Ahem…yes, I still have roses. Crazy I know, these are knock out roses and I swear these babies just bloom and bloom and bloom. 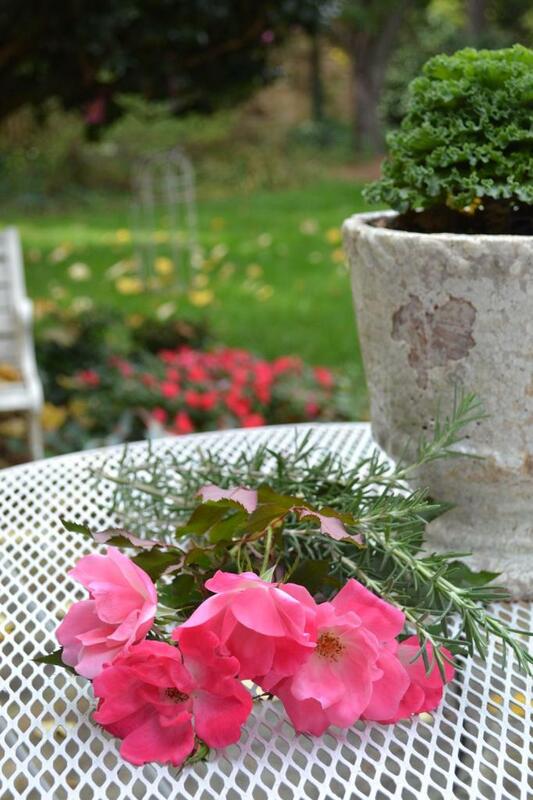 Could they be the perfect rose for a cottage decor blogger? Could be. I filled an ironstone pitcher with pink roses and rosemary from the garden to add some freshness to this space. 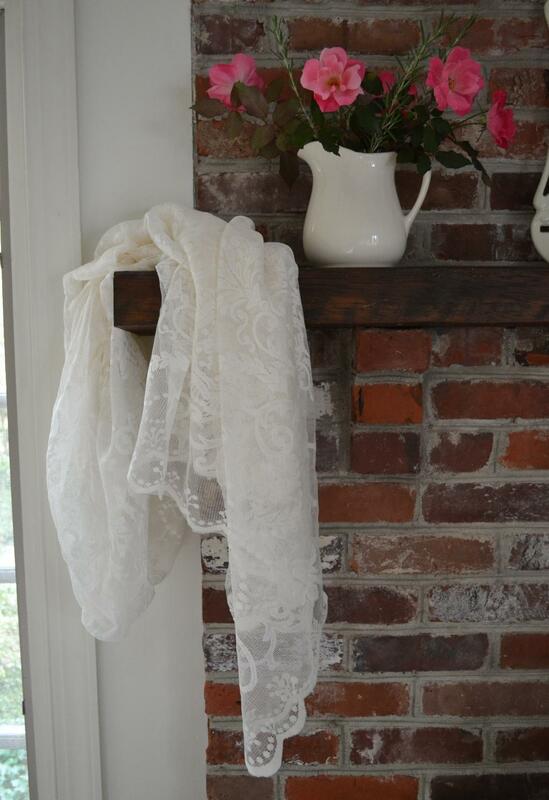 This lace panel will be going on the window adjacent to the fireplace. I was intending on having it already hanging for this post, but I ran out of steam. It’s creamy ivory lace and I’m hoping it will soften up the fireplace wall — there’s a lot of brick girls! Can you see the faint Coca-Cola painted on the row of hooks? I thought the red lettering tied in nicely with the red and cream in the toile panels. 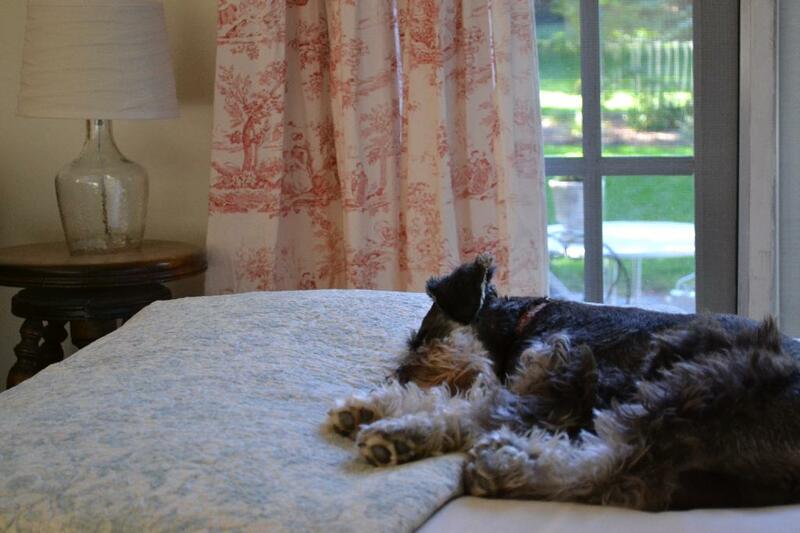 Paisley is just happy to have her best napping spot back in working order! She’s hoping for some new fluffy pillows and soft snuggy throw blankets! I’m just hoping to get this wrapped up before it’s time to start lugging Christmas out of the attic! Better yet, before Thanksgiving would be nice! It’s so funny how we always use the holidays as deadlines to get stuff done around the house! It happens to me every holiday season, last year I was dousing the living and dining rooms with soft taupe wall paint. 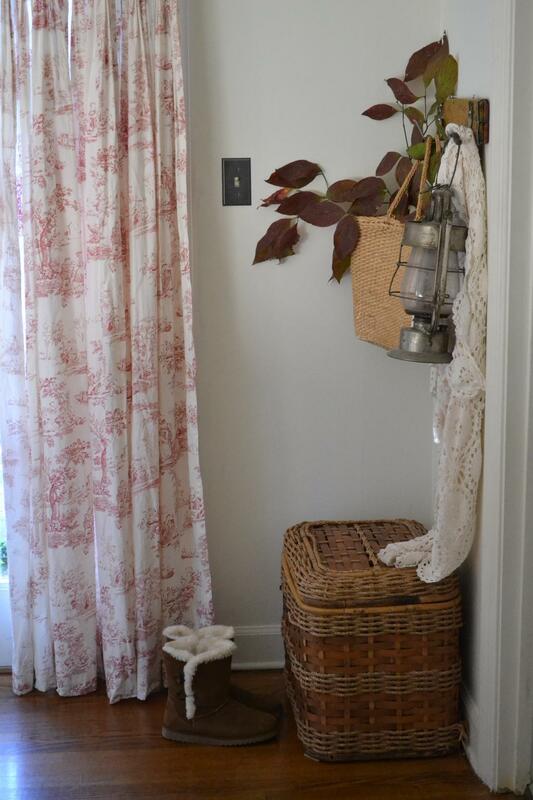 This entry was posted in cottage makeovers and tagged accessories, color, curtains, flowers, paint, warm whites on October 31, 2014 by sally. I LOVE what you’ve done so far, Sally! Your family room is looking beautiful…wall color is so fresh and crisp…love, love, love the toile curtains and baskets. Can’t wait to see more! I love your Grandpa’s lantern, Sally ~ so sweet that you have it. I hope my knock out roses do as well as yours next year. Loving the toile drapes. I just know your room is going to be amazing! The changes you made to your family room look great. I love your new white walls and the toile drapes. Your dog is so cute sleeping in that last pic! It all looks so beautiful. Can’t wait to see the finished room. I like decorating with your families items. 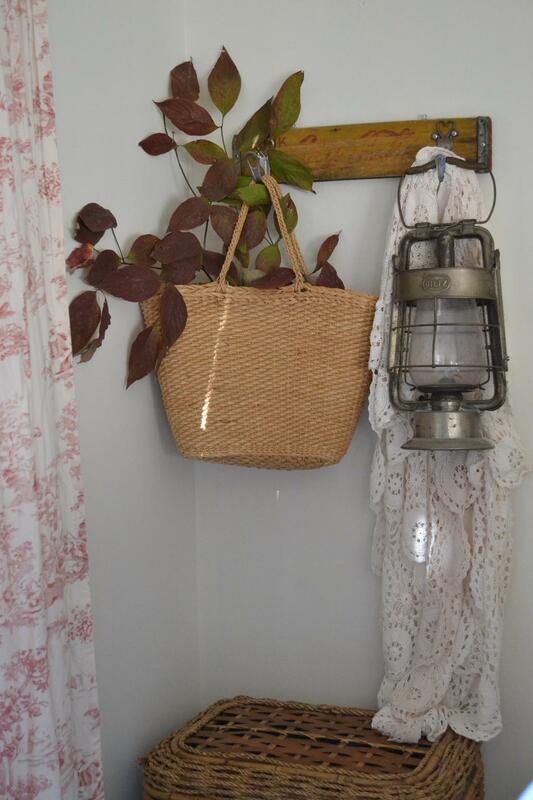 I have my grandfathers antique fish scale hanging from a hook in my kitchen. 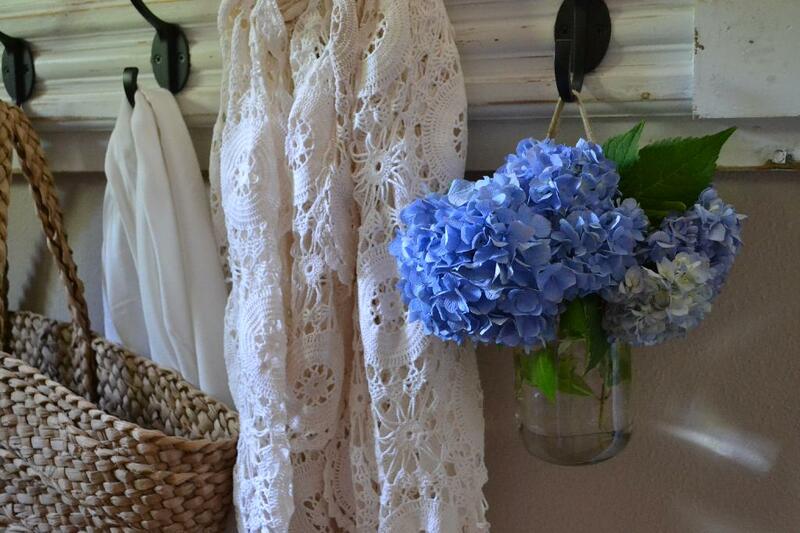 I like the juxtaposition of the more feminine toile and crocheted piece with your grandfather’s rustic lantern. Same thing with that great brick and the lace curtain. You have a good eye for photography, and your dog is super cute. Enjoy the rest of your week. ~ Nancy P.S. Gorgeous roses!